The Mixer consists of mixing drum complete in itself. It contains a mixing drum body, mixing paddle and sealing arrangement. The drum rests on rigid M.S. fabricated body carrying motor, gear box, starter and tilting arrangement. The drive of mixing paddle is through suitable oil filled worm gear unit which in turn gets drive through V belts from a suitable T.E.F.C. motor. The blades of the paddle are so arranged that thorough mixing is obtained. All parts which are in direct contact with the material to be mixed are of S.S. or neutral material. The main paddle runs in journals and supported by thrust bearings of ample size to carry rigid and thrust load. The whole drum of the mixer makes for ease of cleaning. The rotor is so designed that it can be removed by removing the main shaft without much problem. 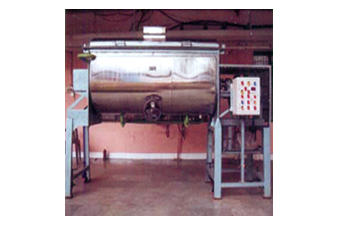 • Plastic Dust Cover provided to see the process all the times. • Safety : If motor covers open it will trop off automatically.